For sales to end-users by Framers/Shops we present a POS display. The display is a must-key for sales-success. No sales without nice exposing and explicating. Every customer can get the attention to buy our hanging system as a premium-add to his/her frame. To provide more information, we added a 4-languages flyer. It informs about choosing the correct length and about the level-best adjusting for hanging. The shop can add it's own information (Name, address, tel. etc.) at the empty area above the frame-image. 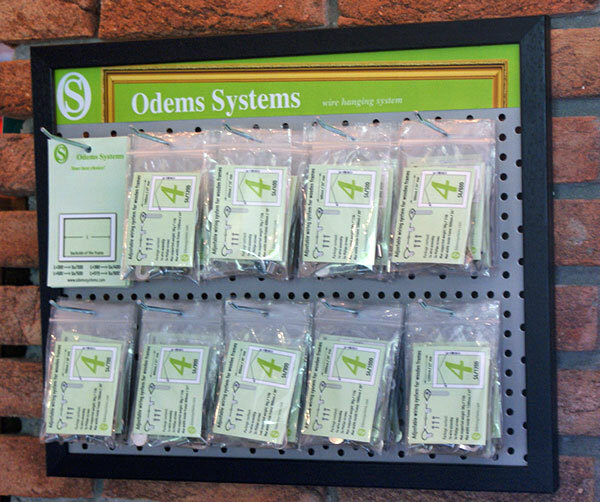 This display is made upon a standard display-plate with hooks/holes at 25 mm / 1". When you have a custom exposing in your shop, we can provide you our OS-banner for free. Please ask our/your distributor. Here you find the information of System-1. Here you find the information of System-4. Here you find the information of System-5. Here you find the information of System-6. Here you find the information of the Metal Parts.